Microsoft has set the gold standard for tablet-style 2-in-1 devices with its Surface Pro, and other PC vendors have followed suit with their own designs. Acer's latest Surface-style device, the Switch 5, offers a couple of advantages but lacks in other areas. I had a chance to play with the Switch 5 at an Acer event in New York City, where new PCs and tablets were announced. The Switch 5 is a tablet first, but a keyboard attachment can be hooked up to make it a laptop. As a tablet, the Switch 5 is quite light, about the equivalent of the Surface Pro 4. The device doesn't look as polished as the Surface Pro, nor does it have the premium finish. But it does have solid technologies, like the latest Intel processor and liquid cooling, that set it apart from rival devices. Acer has priced the Switch 5 at US$799 for the U.S. market, which is higher than the $749 starting price of the Surface Pro. Surprisingly, the Switch 5 is priced starting at a ridiculous €1,099 ($1,192) -- almost $400 more -- for the European market. It will be available in the U.S. and Europe in June, and it will ship in China in July. The Switch 5 runs Intel's Kaby Lake chips, putting it a full generation ahead of Surface Pro 4, which has the slower Skylake chips. 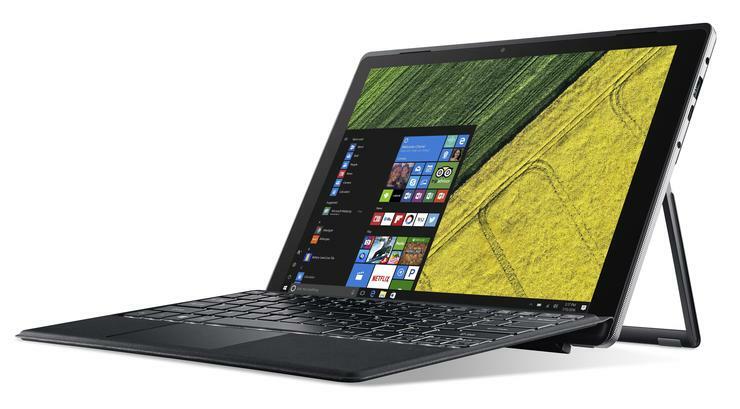 The Acer tablet also has a USB-C port, giving it an edge over Surface Pro, which has a USB 3.0 port. It's not entirely clear if Microsoft will release a Surface Pro 5 based on Kaby Lake, but if so, it could include a USB-C port. The 12-inch Acer tablet has a 2160 x 1440 display, and the screen was sharp. It was hard to do instant benchmarking of the Switch 5 unit, which had a Core i7 chip. But the programs loaded instantly, and the graphics were flawless. In an eye test, the performance was similar to the Dell XPS 13 I use on a daily basis. The magnetic keyboard attachment clipped on to the tablet much like the keyboard for the Surface Pro 4. Inside the tablet is 8GB of LPDDR3 RAM, which is slower from the DDR4 memory going into the latest laptops. That's a disappointment and an area where Acer decided to cut corners. The Switch 5 can be configured with 256GB to 512GB of solid-state drive storage. Acer promoted the device's hinge -- which allows the tablet to stand on a table -- as being a difference maker, but it felt cheaply made. The Surface 4 hinge feels more solid and offers more flexibility for positioning the device. The Switch 5 was silent, and there was no sound of a fan. That's because it has liquid cooling technology inside, using a pipe inside to move water to keep components cool. That has helped reduce the size of the device, and also make it lighter. The tablet is just 9.6-millimeters thick. The Surface Pro 4, by contrast, has a fan to dissipate heat generated by components. The Acer tablet has 802.11ac Wi-Fi, and offers battery life about 10.5 hours, according to the company. It also has a 2-megapixel front camera and a 5-megapixel rear camera. It's priced similar to the Surface Pro 4, so a buying decision comes down to what you want. It's worth buying partly for the Kaby Lake processor and USB Type-C port, but if Microsoft upgrades its Surface Pro, then that decision becomes tougher. The Switch 5 will be a good 2-in-1 device for running productivity software, but it seems overpriced partly because it has some weak features, including DDR3 memory and low-resolution cameras.